Home / 2016 / October / 25 / BIG Backyard Party! We hosted a free community appreciation event Saturday, October 22, to celebrate the grand opening of your newest community park, Robert F. Mays Park. 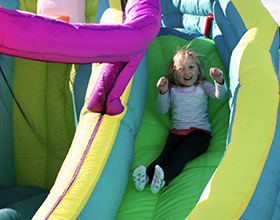 The BIG Backyard Party featured lacrosse demonstrations, games, raffles, face painting, a balloon artist, a magician, a scavenger hunt, a castle bounce house, an inflatable obstacle course and free ice cream! Over 500 people attended this fun celebration. Make sure to add a visit to Robert F. Mays Park to your must-do list!